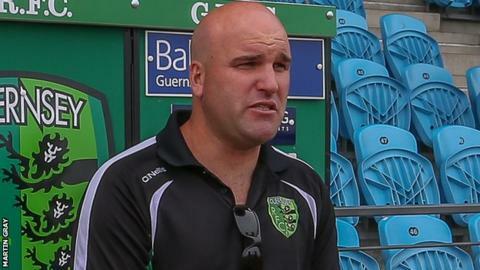 Guernsey Rugby Club have appointed current first-team head coach Jordan Reynolds as their first full-time director of rugby. The 33-year-old has been with Guernsey since 2006 when he moved to the island from his native Australia. Reynolds has previously been balancing his rugby commitments with working in the building trade. "It will allow me to focus a lot more time onto the first team which I just don't have at the moment," he said. It is the first time that the National Three London club has employed a full-time coach. "It doesn't seem like a job to me, so to get paid for something like that is fantastic." Reynolds originally joined the club in 2006 having spent a year playing in Ireland in 2004. The scrum-half only originally intended to stay in the island for a season and use it as a stepping stone to find a club elsewhere in England. But he says he "fell in love" with Guernsey and became part of the coaching team a year later, before taking over as head coach in 2008. "Everyone knows there's no such thing as part-time in sports and it is quite difficult and a lot of coaches will know that," Reynolds told BBC Radio Guernsey. "Being the director of rugby gives me the opportunity to oversee a lot of the coaching within the academy and in the senior clubs and we can try and mould it to try and create a lot of professionalism within the club. "If I didn't get offered it here I would have had to have moved on and done it somewhere else. "To wake up in the morning and do rugby, which I live and breathe every day, it's quite a good thing. "I don't get bored doing anything with rugby, I work until 10 o'clock at night with some of the guys in my team and some of the development that we do.